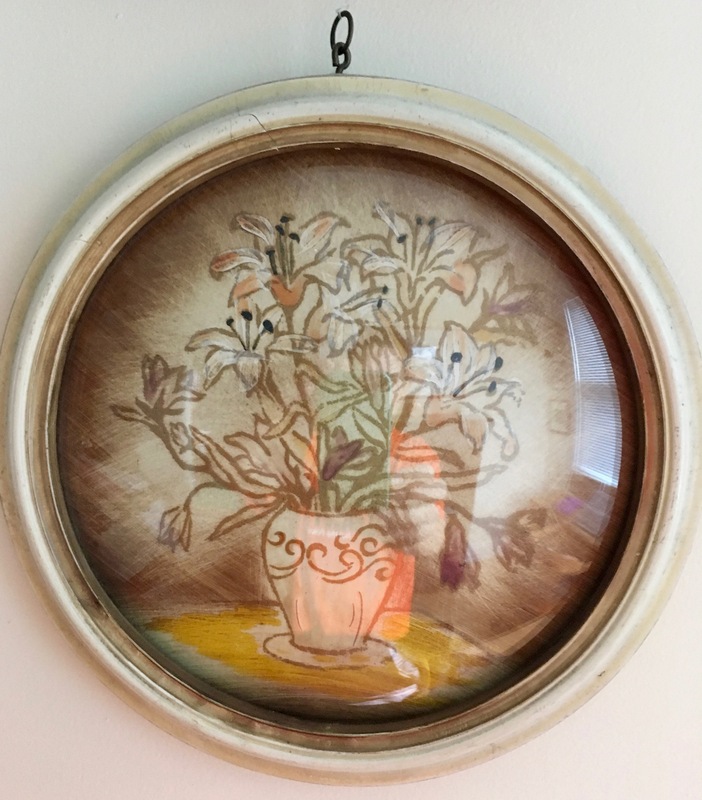 My collective household of four lesbians had found a place on Castro Street, one of those original Victorians with high ceilings and elaborate wood trim, an abandoned coal fireplace and a parlor whose big sliding doors opened to double the size of the room. It was rumored that the apartment had come up for rent because the previous tenants had been busted for selling weed and were all in jail. We embellished the story to claim that the famous Brownie Mary had lived there. She may not have lived there, but she had certainly been there in spirit. It was the seventies; the Castro was becoming a gay men’s mecca. During our time there a housepainter engaged to paint our building ran a brothel turning tricks in the building’s storage room. He painted that building for months. We fondly remember political gabfests at shared dinners, Seders in which we sang all the way through, inventive costumes at Halloween parties (in the year of Anita Bryant I came as a lesbian recruiter). For a time our costume du jour at home was simply a vest, a way to show off a billowing bush and legs as thickly furred as animal pelts (we were hairy and proud!). We danced and sang along to Stevie Wonder and Lavender Jane Loves Women. 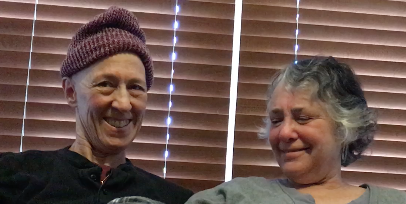 There was much laughing and also much crying. Passionate love affairs abounded. Creating a new culture calls for invention. We tried out nonmonogamy, polyamory. We felt we were on the cutting edge of a cultural transformation. 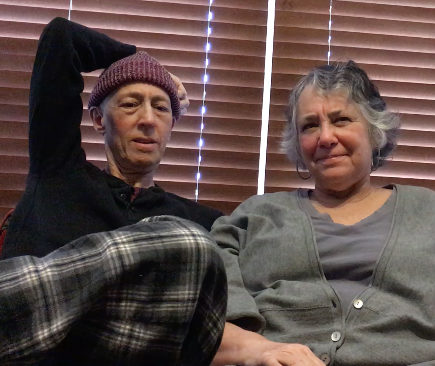 When the gay male couple from New York, or maybe LA, bought the three-unit building in 1978 they immediately evicted us. We had no recourse; rent control was still a few years off. We found a smaller apartment on 29th Street just off Mission in the neighborhood we now call La Lengua. Our landlords were butchers, brothers who ran a shop on Mission right next to what later became Cole Hardware. Weirdly, the buildings on 29th Street and Mission Street were connected. Our apartment always smelled like dead meat, like something had died in the walls. We liked the spot—right behind the Safeway parking lot and across the street from the Tiffany gas station. Pauline’s Pizza was just across Mission and Mexican restaurants like Mi Casa proliferated. I bought my work clothes at Lightstone’s; the post office was right next door. The building’s ground floor held a printer’s shop and the second floor was just a big meeting room that was rented by Union Women’s Alliance to Gain Equality (Union WAGE) which allowed other organizations like Tradeswomen, Gays for Nicaragua, Lesbians Against Police Violence and the Briggs Initiative opposition to meet there. My collective of four politically active dykes—me, two Ruths and a Pam—was happy. We cooked and ate together and invited interesting people to share dinner. Jews and militant atheists ruled. I learned about Jewish culture. The Christmas tree was relegated to a bedroom. It was bliss, except that with visiting lovers and pets (one a gigantic great Dane) and parents and friends the place was just too small. Finally we decided that we either had to pool our money and buy a bigger place or split up the collective. Ruth M decided to pull up stakes and live with her lover and so my lover Nancy became part of our collective. We were earnest idealists; we were gay activists; we had just lived through the horrors of the Moscone Milk murders and Jonestown and the election of Reagan. 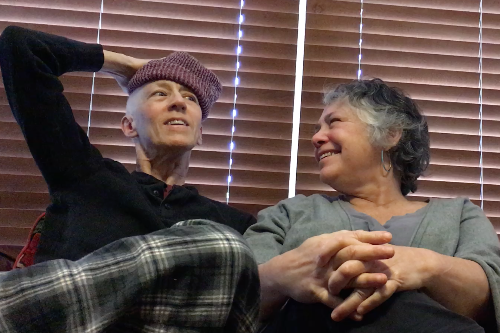 We were committed to live ethically and, even in the midst of what felt like political chaos, we fervently believed we could change the world, ending US imperialism, racism, police violence, and discrimination against women and gays. We were part of a collective movement that emphasized cooperation and consensus decision-making, a radical departure from capitalist organization that resulted only in winners and losers. We listed our requirements for the new house. Ruth had to have a garden. I desperately needed a garage to store my electrical contracting tools and supplies. We had to be close to public transportation. We didn’t want a fixer upper; no one had time for that and I was the only skilled tradeswoman. We were committed to collective living and we also fantasized about eventually dispensing with private property. What if we could donate the place to a land trust so that our dream of a lesbian nation could live on into future generations? The listing price was $135,000, an incomprehensible amount. A hundred thousand then felt like like a billion now—you couldn’t get your head around it. 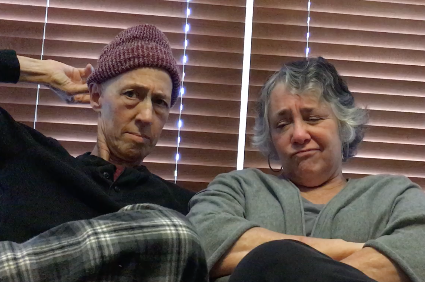 Still, we dug deep and came up with the down payment, only because Pam was able to borrow money from her family. Then we wrote up a new contract to repay Pam by the month. We got pretty good at writing contracts. As soon as we took possession in 1980, our place in the property hierarchy changed. We became agents of displacement. All three of the units were occupied. Each of us had to evict tenants before we could move in and none of us could afford to pay both rent and mortgage for long. Oh the contradictions! I talked with the couple in “my” unit, offering to help them find a new place. Our exchanges were friendly and civil, and they soon found new housing. But Ruth couldn’t even get the tenant in “her” unit to open his door, though she could hear him spewing expletives from the other side. She resorted to lawyers and eviction notices. As much as we wanted to live collectively, the house on Richland restricted collectivity. Having separate apartments led to fewer shared meals, less knowledge of each other’s daily lives. I retreated into the dreaded merged lesbian couple relationship. After a few years the original members began to sell their shares and move out while others bought in. At the cusp of the 80s our world changed. That frantic hopeful creative collective time was ending. But we are still here. Since the birth of our dyke-owned dream, we have aided the lesbian colonizing of San Francisco and particularly Bernal Heights. With each refinancing (too numerous to count) and buyout, our property underwrote the purchase of new female-owned houses. When we started, four single women buying property together was rare and suspect by financiers. Tenants-in-common was not a typical way to hold property. Since then it’s been adopted by the real estate industry as a way to make buying of increasingly expensive property possible for groups of unrelated individuals. We were agents of change, the leading edge of a new wave of homeowners in the Mission and Bernal Heights. But change is not new to our neighborhood. As one of the authors of a small history of Bernal Heights, I researched its historic demographics. Irish squatters displaced the Mexican land grant Californios. European immigrants made homeless by the 1906 earthquake and fire moved earthquake shacks here and built new homes. Southern Italians colonized the north side of the hill. Germans, Swedes and Italians built churches here for ethnic congregations. Mexicans and blacks found a neighborhood free of racist covenants and restrictions, although Bernal was not outside redlining boundaries. During the economic downturn starting in 2008, big banks (locally based Wells Fargo gained our enduring hatred) evicted scores of homeowners, most of them people of color. Now houses on this block are selling for millions and the techies are moving in. The life we built is changing. Pat Norman retired, sold her house and moved to Hawaii. My long-time friend on Andover, the first lesbian I met in the neighborhood, just sold her house and moved to Oakland. And now I’m selling the apartment where I’ve lived for 37 years in order to colonize a neighborhood in Santa Rosa. Our particular experiment may be ending, but the neighborhood is still full of dykes. 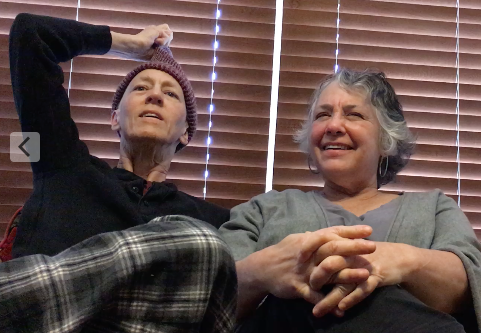 In Bernal Heights, lesbians found an affordable generally accepting environment. At one time I heard that the neighborhood was home to more woman-owned property than any neighborhood in the country or in the world. Who knows; that may still be true. 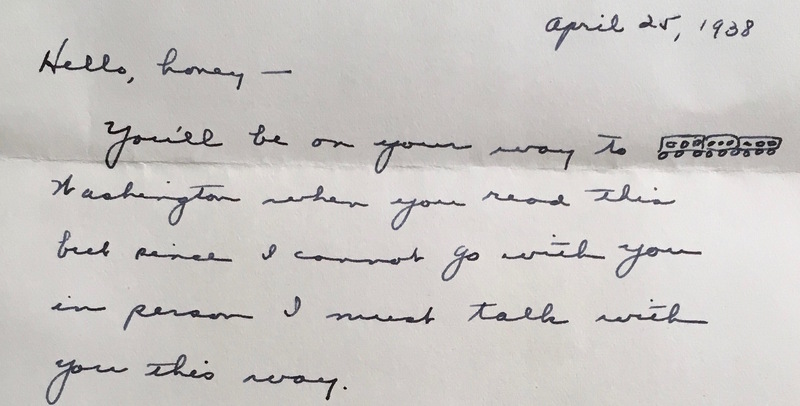 Rummaging through my mom’s scrapbooks from the 1930s I came across a packet of letters, a rare find. 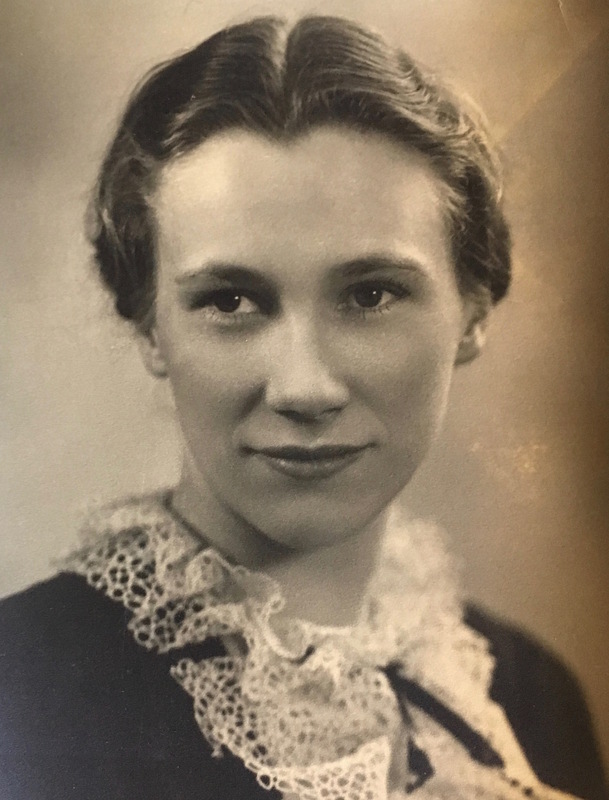 My mother saved minutiae from her life: bridge tallies, restaurant menus, cocktail napkins, greeting cards, dance cards, wedding invitations. But she saved almost no personal letters, although I know she wrote and received troves of them. 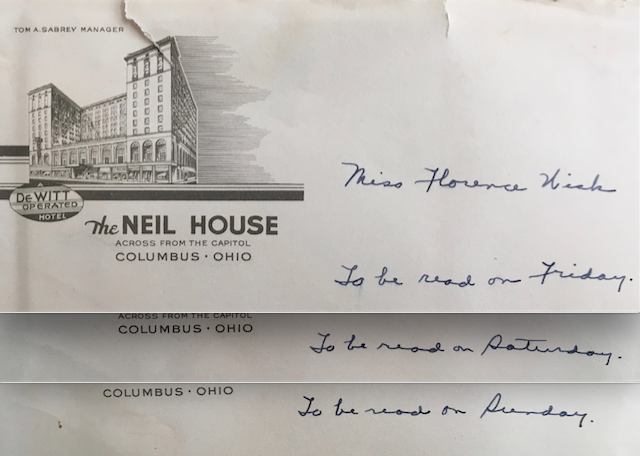 The envelopes are all addressed to Miss Florence Wick and marked on the outside: “Via the usual route,” “To be read on Friday,” “To be read on Saturday” and “To be read on Sunday.” Carefully opening the tattered envelopes, I found hand-written notes on stationery from the Neil House Hotel in Columbus, Ohio. They looked to me like love notes—from a woman named Edna L.
Haven’t we had fun with meetings and parties and “baths” and rushin’ ‘round! And what am I going to do without you when you are gone? You will just have to come to New York sometime soon so we can share some other experiences…. Love and a hug—Edna L.
What did she mean “baths”? OMGoddess! I had to call my brother Don immediately. “Flo had an affair with a woman! I have proof!” I blurted. Perhaps I could have approached the delivery of this information differently, building up to the climax with more suspense. My brother’s lack of excitement revealed my failure. “You’re making up things again.” He could have added, “just like Dad.” Our father was an accomplished teller of tales, amusing but not to be believed. My wife Holly was equally suspicious. I hadn’t realized I’d built such a reputation for exaggeration. No one believed me. I just had to revel in my discovery alone. I delved further, looking for more information about Edna L. I read the letters over. Edna sometimes signed her name Eddie or Edie, but she never included her last name. I love that she called herself Eddie, a definite lesbian cue. She illustrated the notes with endearing stick figure drawings. From the letters I learned that Eddie and Flo had roomed together at the national YWCA council meeting in Columbus. Eddie had written the notes during their time together and given them to Flo to be opened each day on the train ride home to Washington State. How romantic! I read through all the accompanying articles and programs about the national YWCA council meetings that Flo had attended in Chicago and Columbus in 1937 and 1938, but I couldn’t find any mention of Eddie. I looked at every picture in the two scrapbooks. 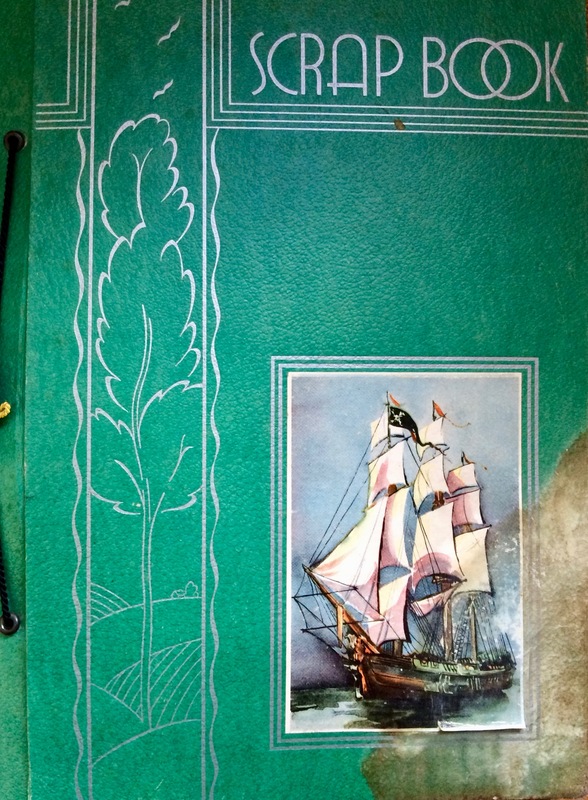 Flo had devoted two pages of one scrapbook to pictures of a woman who had died, kind of a shrine. 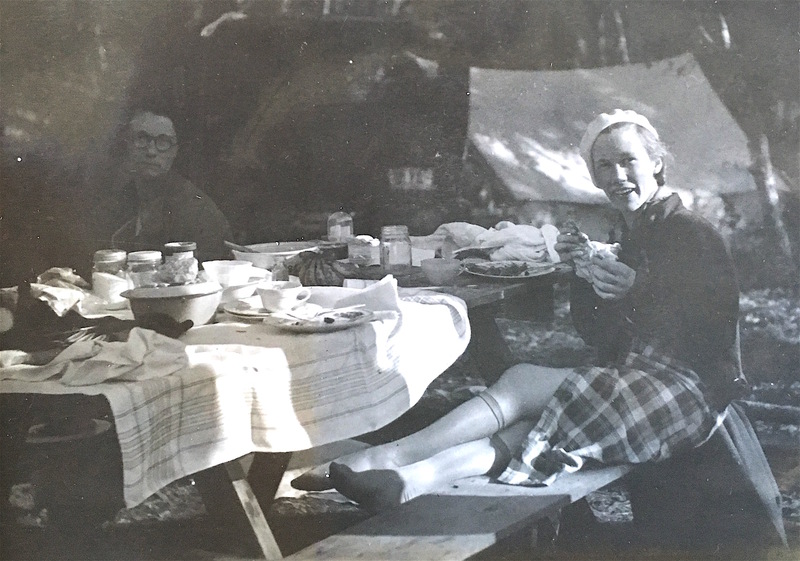 The pictures show Flo and the friend on a camping trip in the mountains. 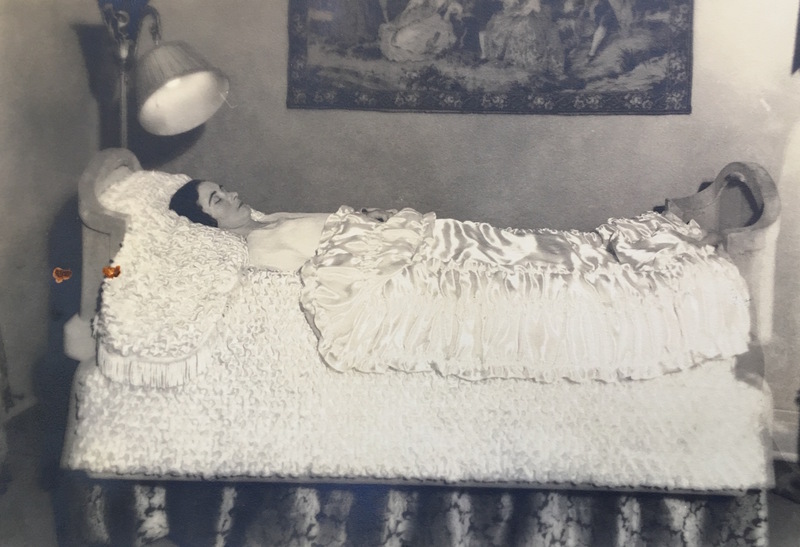 The woman’s death photo, showing her body lying on a coffin-like bed, is in an envelope pasted in the scrapbook, but there is not a single clue as to who she was. I pulled up the photos to see if there was anything written on the reverse side. Nothing. The woman in the photos looked rather morose. Could the dead woman be Eddie? Did Eddie kill herself after Flo spurned her advances? Reading the letters, I can see she was clearly smitten, but there’s no indication that Flo felt the same. I let my imagination run wild. My poor mother! She must have felt terrible guilt. No wonder she left no clues about the identity of the dead woman. My brother seemed slightly more interested in this new theory and he agreed to help me research the dead woman’s identity. We found one clue in a picture that decisively ties the dead woman to Flo’s hometown Biz-Pro group, and from her letters we know that Eddie was from New York, so I had to abandon my romantic story about Eddie. However, I’m holding onto the suicide theory until we can identify the dead woman. I can totally see how my adorable young mother might have inspired unrequited love.